Widespread Gas Shortage In Mexico As Government Tries To Thwart Fuel Thieves The country's new president says $3 billion worth of fuel was stolen from the state-owned oil company last year. People line up to buy gasoline at a gas station in Morelia, Michoacan, on Jan. 8. Michaocan is one of several Mexican states where fuel shortages have been reported. The government has shifted transport of fuel to tanker trucks and rail cars and away from pipelines, which are regularly tapped by thieves. But the new distribution systems apparently can't keep up with consumer demand. Pemex has had to tell customers not to panic or hoard fuel. Major fuel shortages have been reported in at least six Mexican states over the past several days and images showed people lined up at gas stations, empty canisters in hand. 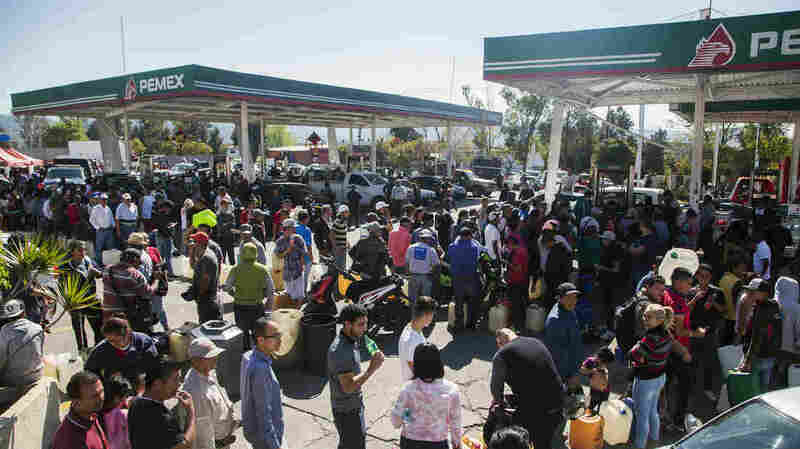 Video from Guanajuato – where the Associated Press reports that 84 percent of gas stations are closed – shows a miles-long line of cars waiting to tank up. In Michoacán, a logjam of vehicles was stuck trying to get to a gas station's pumps. Some gas stations in Mexico City were also reportedly closed. López Obrador – who came into office promising to battle corruption — says the new defensive measures are working and that fuel thefts have dropped substantially. Fuel thieves — known as huachicoleros – have long been a staple of Mexican crime, as Rolling Stone has reported. But in recent years they've gone from being rag-tag groups to organized gangs, controlled by the country's infamous cartels — and their lucrative thefts have been brazen. On Tuesday, López Obrador – who has deployed soldiers to safeguard fuel supplies – said the government had discovered a 2-mile-long hose siphoning fuel directly from a refinery. He also said special warehouses have been built on top of pipelines by thieves. López Obrador noted last month that even those kinds of bold tactics still wouldn't account for the massive amounts of fuel stolen each year. He said corrupt officials are complicit in broader schemes to profit off of stolen government oil. Fuel theft has also become a lucrative occupation for those in poorer parts of the country. As the New York Times noted, "Where a farmhand might earn $7 to $11 a day ... a lookout for the fuel thieves can bring in upward of $54 a day." "I ask citizens for understanding and support, because we need to solve this problem together," López Obrador said last week. On Monday, he told Mexicans he wouldn't back down from his campaign to fight the thieves. "Let's see who gets tired first: Those who steal the fuel or us."